Historic Guide to The Church of St Peter and St Paul, Bleadon, North Somerset. This page will help you trace a little of the progress of the building through the centuries to the present day. There is good reason to believe that there was a Church on this site in Saxon times, although nothing remains, except perhaps the little stone angel set high in the arch on the North wall. The double dedication of St. Peter & St. Paul was commonly used for Saxon Churches when the two Saints shared the same feast day. The fact that our Church bears this double dedication certainly indicates an early Christian foundation. There is an Anglo-Saxon Charter for Bleadon dated 956 by which the boundaries of the Parish are defined and there does appear to be a reference to a "Church site". When the Doomsday book was compiled, Bleadon was noted as "applied to the use of the Refectory of the Monastery of Winchester". This was the result of a gift by Githa, wife of Earl Godwin and mother of King Harold, who gave Bleadon to Winchester in 1053. It remained in the gift of the Bishop of Winchester until May 1852 when Patronage was transferred to the Bishop of London. In 1903 advowson passed to Miss E. Galloway and one year later in 1904 Mrs. Zara David of Bleadon became the Patron. Mrs. David passed the Patronage to the Guild of All Souls in 1927 where it remains to date. A selection of incumbents through the centuries. While it is highly probable that there were other Priests who preceded him, Richard Pay is the first recorded name that we have. Edward Powell, born in Wales about 1478, was a Fellow of Oriel College, Oxford, where he took his doctorate of theology in 1506. He accepted the living of Bleadon near Weston-super-Mare, became a prebendary of St. Mary Redcliffe, Bristol, and was given other preferments. After the accession of Henry VIII he became a frequent preacher at Court. On the spread of Luther's doctrines to England, Powell took an active part in opposing them by writing three books. On the question of Henry's divorce from Catherine of Aragon, he was one of the learned divines who spoke against it and is said to have been one of Catherine's advocates at her trial. From this time he was out of favour at court. When Latimer was invited to preach before the Corporation of Bristol in March 1533, Powell was put forward by the Bristol clergy to answer him. Some accounts say he preached on College Green. Latimer complained to Cromwell and Powell replied by denouncing the Kings marriage to Anne Boleyn. In 1534 he was arrested, brought to trial and condemned for refusing to take the oath of succession. He was deprived of all his preferments (except it seems, the living of Bleadon where he is listed as rector until his death), and committed to the Tower where he remained for six years. In 1540 he was attainted for so-called treason, for denying Henry's supremacy over the church, and "adhering to the Bishop of Rome". On July 30th in that year he was hung, drwan and quartered at Smithfield with two other priest, Bl. Thomas Abel, chaplain to Catherine of Aragon and Bl. Richard Fetherston, tutor to the Princess Mary, daughter of Catherine. They were beatified by Pope Leo XIII in 1886. It is interesting to recall that three Protestant divines were put to death at the same time and place, by burning. One of these was Dr. Robert Barnes. Suddenly of a suffocation, the Rev. W. Norman Rector of Bleadon, Somerset. Rev. W. Norman Rector of Bleadon County Somerset as he was sitting at supper (on the 25th) with a friend, he observed his brother, the Rev. Henry N. take a large knife from the case and go out into the kitchen. He immediately called to the servant to take it from him, which through fear he omitted to do. Soon after, Henry returned to the parlour, with the knife concealed under his coat, and, unobserved by his brother, came behind him and stabbed him twice. The unfortunate gentleman lay in the greatest agonies of pain till the evening of the 27th when he expired. The wretched perpetrator of this horrid act is the Rector of Morsted, near Winchester, and having been some time deranged in his intellects, was removed to his brother at Bleadon, for security and in August last appeared in a more serene state than for some years before. He therefore had greater liberties allowed him and the tragical event happened as above related. The unhappy maniac, we are told, being asked by his servant when he should return home, gave for answer "As soon as he had killed his brother". No notice was taken of this. He has since been confined to a private mad house. According to an account by "Churchgoer" David Williams was somewhat remiss in his parochial cares and indifferent in his conduct of services. However, he was a keen archeologist and geologist and we are indebted to him for a unique collection of animal bones and fossils discovered in and around Bleadon. He is described by a contemorary as of huge build, with a farmer-like face and a head full of the strata and antiquities of Somersetshire. Lionel Powys David was Rector of Bleadon from 1911 until his death in 1952. He was held in great affection and respect by the Parish. Old and young alike enjoyed the parties hosted by him and his wife in the old Rectory in winter and in the garden in summer. The legacy which he left to the Church was used in 1956 to move the organ from underneath the tower at the West end to the new organ chamber to the North of the choir stalls, as a memorial. 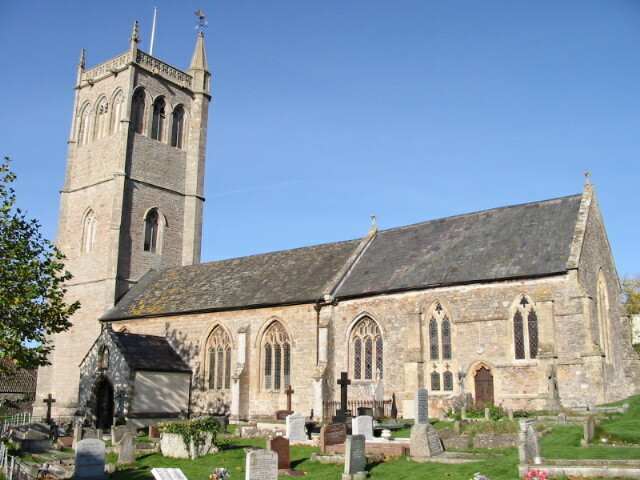 The tower at the West end of the church was added in the early 15th century. A glimpse of a pleasant stone ceiling can be seen through the vestry screen. The tower is officially dexcribed as "Perpendicular of the triple windowed class". It is some 80ft in height and roofed in lead, which was renewed in 1962, replacing lead dated 1766. The tower has several interesting gargoyles, in particular the little man in tight hose, sitting cross-legged and playing a form of bagpipes. 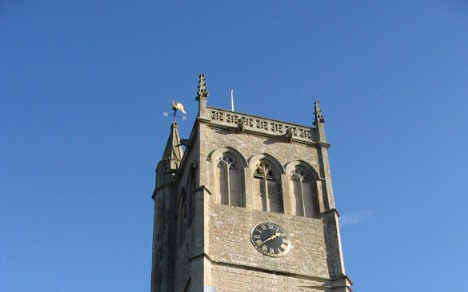 He can be seen on the left above the clock dial on the west face. The tower contains three chambers - the ringing chamber, the clock chamber and , highest of all, the belfry. The tower staircase rises exactly on the North-East corner of the tower and is crowned by a weathercock. 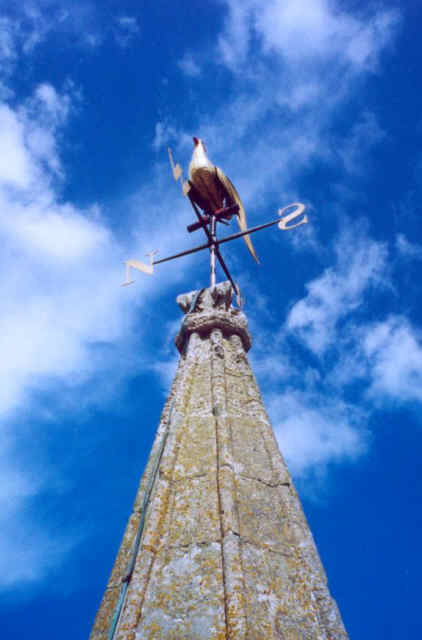 The weathercock of gilded copper was purchased in 1833 when the Churchwardens accounts record - "paid Samuel Taylors bill and weathercock £52.1.1d". Experts have described it as a fine example of Folk Art as it is a complete bird with feet and talons It was stored in Church from the 1953 restoration when the turret was considered to be unsafe until 1996 when the tower was repointed and the turret strengthened. The regilding and replacement was made possible by The Bleadon Players who raised the necessary funds in 1996. The gargoyles are worth noticing and the square drip-stone over the West door terminates with two symbolic heads, one mitred and one crowned, to signify spiritual and temporal power. The exact date of any bells being hung is not known but may have been as early as the first half of the 17th century. The massive oak frame has a date of 1627 on one of the king posts. This frame still holds the present ring of six bells and although now tie bolted, is in sound condition. It is known that five of the six bells were cast by Edward Bilbie in 1711 and the sixth in 1925 by the famous Whitechapel Foundry. These bells were re-hung on metal instead of wooden headstocks and ball bearings rather than plain bearings in 1984 - thus making the bells easier to handle. 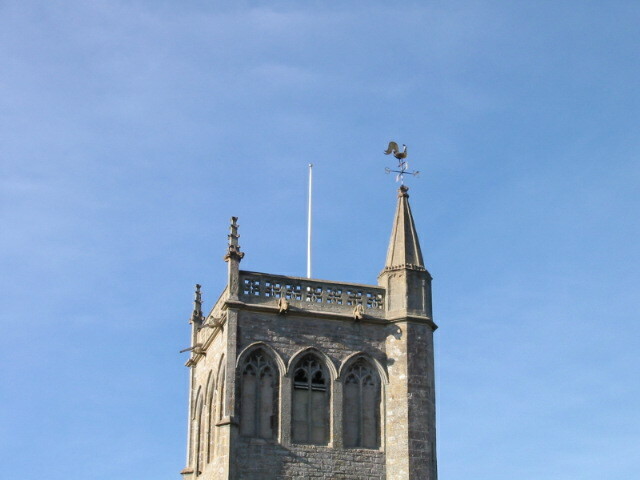 Ringers who visit Bleadon also notice one unique feature: the bells are hung in an ant-clockwise direction. This curious phenomenon is shared with Crowcombe, on the Quantocks and Bath Abbey. This is the oldest part of the present building and is recorded as having been dedicated in 1317. At that time, the East wall was some 12ft further East and there was a Sacristy at the North East corner connected to the Chancel by a door. Traces of this doorway are still visible in the outside wall. 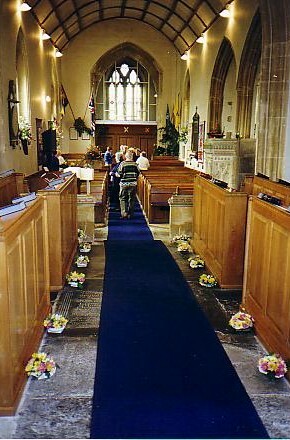 The subsequent shortening of the Chancel accounts for the way in which the canopied tomb on the right of the altar is cramped against the East wall. The stone slab covering this tomb was lifted some years ago and a stone coffin was revealed. The Priest's door on the South side of the Chancel has an attractive stone canopy, which incorporates a small monkey-like corbel head on the western side. Set in the wall on the left of the altar is the aumbry. The modern lamp which hangs above denotes the presence of the reserved sacrament. If you would like more information on stained/painted glass. Then I recommend http://www.glasspainter.com/. Here you can see the work of John K Clark and follow his latest project as it unfolds in the studio. This window, erected in 1964 by the people of Bleadon. is the work of a lady artist, Miss Marion Grant. The little figure of a nun which is her "signature" may be seen low down in the left hand light. The following notes by Miss Grant. give us an insight into the artist's approach to the work. Service by Freewill and Acceptance .. The main theme starts at the top of the central light, with God the Father and Creator, without whom nothing starts at all. The traditional symbol of the Hand of God is used. All around are rays of Divine Glory. Clouds. Sun. Moon and Stars.He left us His example and a very few simple instructions, promising to send the Holy Ghost to explain all things as we became able to understand them. The subject is incomplete without the third Member of the Holy Trinity, depicted by the Holy Dove described at the Baptism of our Lord. Rays of Glory descended from the Father to the Holy Ghost and to God the Son. The Ascended Christ is enthroned in Glory, seated on a rainbow described by St. John the Es angelist in his book of Revelation, on which is inscribed IC XC NIKA (Jesus Christ Triumphant). His feet rest on the orb, symbol of the universe, under the Divine Power of God's unceasing creation. About Him are Seraphim, representing spiritual love (and therefore by tradition red in colour) and Cherubim representing intellectual love (blue). He is Alpha and Omega. A subject for an East Window is inseparable from worship at the celebration of Holy Communion, for architecturally the East Window was intended to form the reredos of the Altar in the majority of English Churches. Therefore the presentation of an East Window subject naturally has some visual link with the Altar in its design. By this link the design projects a train of thought towards contemplation of Life Eternal which Our Lord, Redeemer of mankind, made it possible for us to inherit by His death on the Cross. Therefore at the foot of the centre light and just above the Altar Cross, the Pelican in Piety is shown. Its origin as the symbol of Sacrifice is lost in ancient ecclesiastical art; rather than let her young die, the Pelican pecks herself in order to feed them on her life's blood, and by the same tradition her nest resembles a Crown of Thorns. (1) Surrender to Him of the Free Will God gives you. (2) Absolute faith in the acceptance of God's will, without the foreknowledge of the form of the individual's service to him. St. John the Baptist was acutely aware that, before free-will can be surrendered to God, not one of us can escape making the deliberate choice between surrender to, or rejection of God. He was aware that only after we have surrendered our free-will to God can we receive His gift of Repentance so that by his Grace, we may then receive His forgiveness. St. John realised and accepted that God's Will for him was to herald the coming of Christ the Redeemer to the multitudes, and to prepare His way by making them aware of the desperate need to repent and return to God before it is too late. St. John the Baptist is shown in adoration at the foot of the Throne, clad in the rough garments of one whose service to God impelled him to live from hand to mouth in a wilderness of need and suffering. Below St. John, bearing the banner of the Resurrection is the Lamb, symbol of the Risen Lord, whose coming John went forth to proclaim "Behold the Lamb of God". The Lamb is supported by the book with the seven seals described in the Book of the Revelation. The life of Our Lady demonstrates a life of devotion to God by free will and faith. Awareness of God enabled her to recognise the opportunities of service that He gives to those who choose to live their lives to His Glory,. and also to prepare herself for His service, although humble and unknown during the preceding years of her life. Unquestioning obedience to God's intention for her followed - perhaps with little understanding of what it was to mean - and she lived her life regardless of personal cost. Our Lady is shown in adoration opposite St. John, and like him, by glorifying God, she too is reflected in the Glory of Eternal Life. Below her is her own emblem, the Lily. Here it is shown in cruciform as a symbol of the Incarnation, yet foreshadowing the Crucifixion; the Star of the Nativity has become the badge of the Mother of God. Above, at the top of the light, St. Gabriel, Angel of the annunciation, holds a plaque bearing her name; opposite is St. Michael, displaying the feathered armour and flaming sword of the Guardian Archangel of the Heavens; he holds a plaque bearing a monogram of St. John, Baptist. Both join in the unceasing adoration and worship. Immediately to the west of the Priest's door is a window with a sill much lower than the rest. This is known as a low side window. The Priest's stall was usually sited in front of this window which had opening lights to allow the Sanctus bell, situated on the south side of the chancel, to be rung at the Elevation in the Mass. We know that the chancel was shortened by 12 ft. and we believe that the original chancel with choir, would have been east of the Priest's stall and to the west would have been a central tower and a crossing. forming a Cruciform church. The external south wall shows signs of infilling, no doubt carried out when the central tower collapsed as so many of them did. The pulpit carved with Tudor flower and vines dates from about 1460. 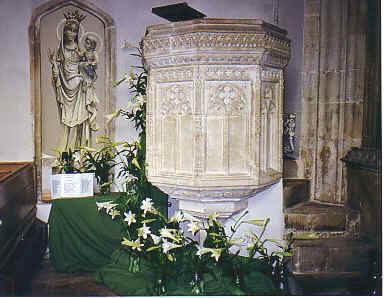 It is one of about 60 mediaeval stone pulpits which remain in England. It is interesting to note that it was not until 1605 that Churchwardens were required to install pulpits in churches. The only visible remains of the rood screen. which was removed in 1908, is the little stairway behind the pulpit. The oak doors studded with antique nails were fitted during the 1953 restoration work. A portion of carved wood from the old screen does duty as an overmantel in a local cottage to this day. The two arches in the north wall are a little puzzling. Investigation has failed to reveal any foundations to bear out that there had ever been a building here. It almost seems as though a building scheme was started and abandoned. The little stone angel with the shield is very early, possibly Saxon. The lower head is of the 13th or early 14th century. These tiles dating from the late 13th or early 14th century were dug up from the Churchyard at the eastern end of the church. It is probable that they once formed the floor of the 1317 chancel. Among the heraldic designs are the Royal Arms of England, King Richard 1 (Gules, 3 leopards passant, guardant, or.) and the arms of the De Clare family, (Or. 3 chevrons gules). The De Clares were successive Earls of Gloucester. The Font is said to be a Norman tub font. The pedestal and steps on which the bowl is supported are later and were probably added when it became the custom to baptise infants by, pouring water over them. 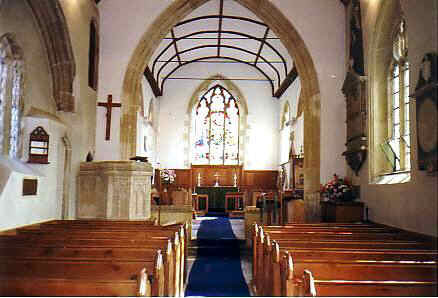 The Oak screen, dividing the vestry from the nave, was set in place in 1953 when the organ was removed from this site. The three shields symbolise: the Crossed Keys of St. Peter, The Crossed Swords of St. Paul and the Cross of St. Andrew, signifying the Diocese of Bath and Wells. The screen is the work of Messrs. Robinson of Kingston-upon-Thames who, during the same period, supplied new doors throughout the church together with the oak sanctuary tables. The glass and aluminium screen which fills the archway, above was installed as a memorial to Mr. George Goodman, who served over 55 years as verger. It will be noted from the brass plate near the pulpit that his predecessor served almost as long. Between them they spanned a century.